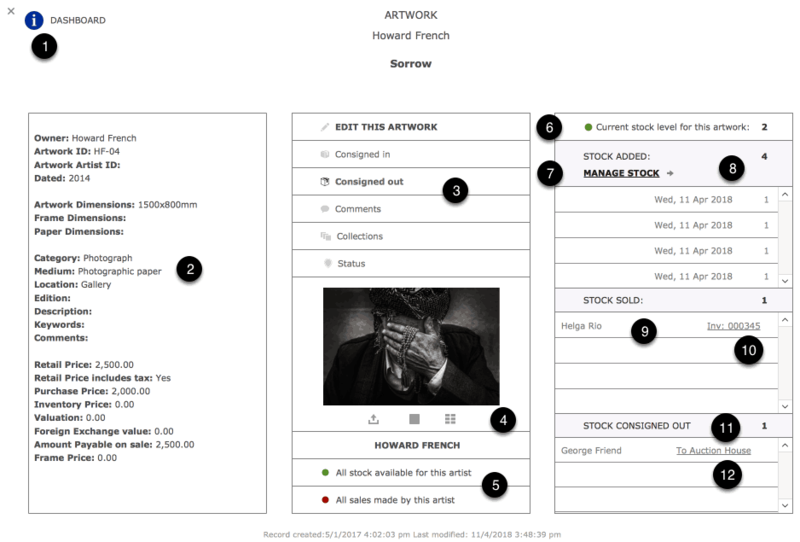 The Artwork Dashboard gives you an overview of all details related to the selected artwork. The Dashboard can be accessed from labelled buttons or anywhere you see the Artwork Title underlined and accompanied by the “i” icon. The Dashboard has several screens all of which include a Dashboard Icon which when clicked will always return you to this main Dashboard Screen. Move to the relevant Artwork Edit screen. Review to where artworks have been consigned out. Add, review and amend artwork comments. Add and remove this artwork from available Collections. Review and amend any artwork status set on this artwork. 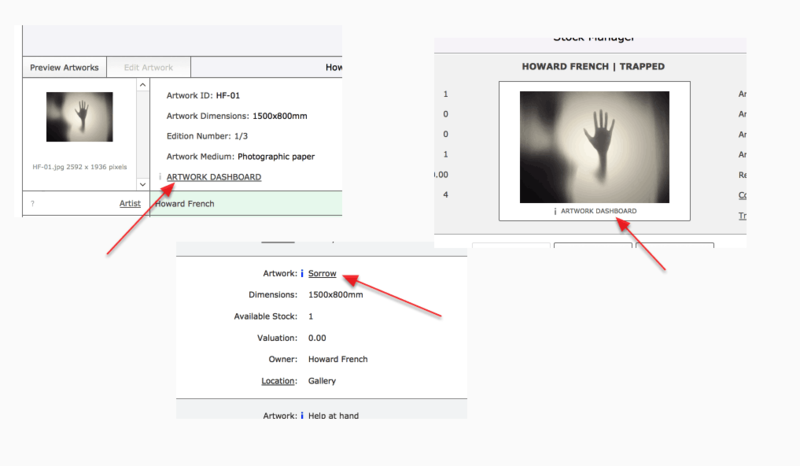 Artwork Image controls to review image, forward image or view all images by current artist. Review all artworks sold by this artist and in stock by this artist. Stock contorls also feature the ability to edit pricing and other details. The current level of stock for this artwork. Click on Stock icon for explantion. Use the MANAGE STOCK button to move to the Manage Stock screen. The number of stock items that have been added for this artwork. Review all sales for this artwork. Click on Invoice to review details of sale and move directly to invoice if required. Review all items consigned out from Tessera. Click on underlined Consignment title to review details and move directly to Consignment Document where required.